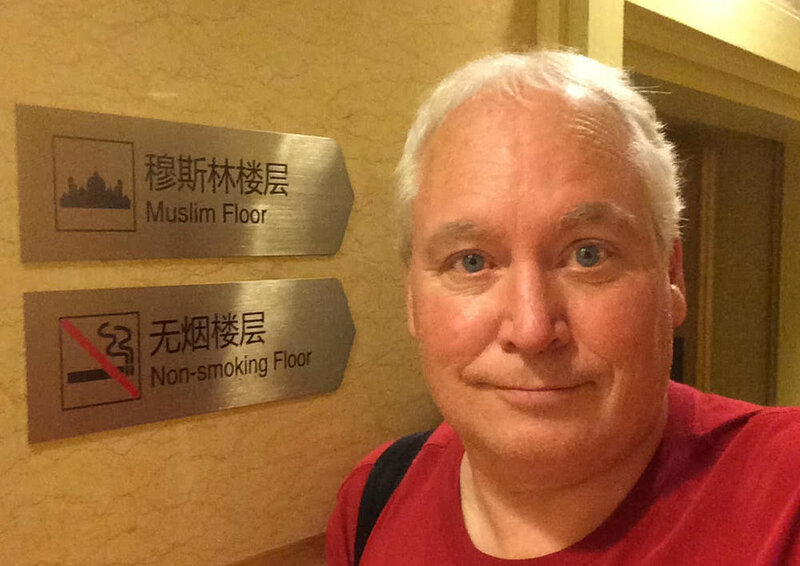 I just got Upgraded to the Muslim floor of the hotel in Urumqi. It's the top tier. This floor is Cleaner than the hotel's ordinary Chinese Han floors. It's "Uyghur-riffic". Decked out with geometric figure patterns and LED -lit. Pictures of ancient camel caravans. The bathroom faucet is a replica of Aladdin's Lamp. I'm not joking. Signs everywhere written in Arabic. Amazingly stereotypical. Gaudy. Overdone. So I'm "moving on up". To the Mecca side. I can't make this stuff up, and it's too implausible to be true. So here's a photo to prove it. The whole city stinks. And the water is not safe to drink. I must rinse my toothbrush with bottled water. I think this hotel caters to the oil industry. Or it used to. That industry is in ruins right now. The hotel is less than half occupied. I arrived before the EV rally entourage got here. Will Meet up with them when they arrive tomorrow. I hope. Click here for more of Don's amazing story through Russia and Romania on the 80 days around the world race. Cher and Kris at Huber's. See the $900 crystal carafe over Kris' shoulder? I leave Dunsmuir on Sunday, August 14 on Amtrak, this time on business class. Met Thomas Carlisle at Breakfast in the dining car, seated four to a table. There is no Wi-Fi over the Cascade Mountains. Kris Akins, my friend from eight years ago when she owned the Brown Trout on Sacramento Avenue, meets me at the Portland Union Station, PDX. She drives a little Smart Car. We squeeze my bags into the diminutive hatch back and put-put to the Mississippi Street neighborhood where she lives in a new apartment in the hip up and coming area of north Portland. Here new infill and old Victorian styles blend eclectically like the weird Portlanders mesh with the new hip Gen-X and Millennials. I learn that the reserved Portlanders are foodies, they love their craft beer and legal pot. That evening we stroll up the street to Slate with a chill vibe Bavarian style bar menu: sauerkraut worst and the ubiquitous garden beet salad. Kris and I catch up on things. She and her husband, Art, ran the Brown Trout for a few years between Michael and Wendy and Cindy Forman. We emerge in the afternoon. She takes her bike, and I grab an orange one and try to keep up with her through the older Victorian neighborhood behind Mississippi. The elderly and mostly black homeowners are selling, taking their appreciation and moving to Sun River or Bend. Kris waves to a quartet of gentlemen playing cards under the shade of a popup as we pass. Courteous and reserved drivers stop for us at intersections. No one seems in a hurry. No horn honks. BUT there is a lot of traffic, a trending topic for conservation with locals. They express dismay at the growth, but digging it, too. At Alberta district, a less polished neighborhood with more diversity, younger people, more vacant buildings wait to be discovered and rehabilitated into future homes to design boutiques, bistros and clubs. I park and lock my clunky orange bike. Although William, the bartender, and his waiter are tattooed and coiffed to give a biker flavor to my first impression of Hilt, it doesn’t discourage us and other ladies from climbing onto stools in the warm, dim room. Kris tells me the Hilt is packed when they have a band, inspiring patrons to pull dancers off the sidewalk, over the low fence and into the patio. William’s berry vodka mojito and Hilt’s excellent BLT calls to my memory. We grab a Smart Car and put-put downtown to the Portland Art Museum. Downstairs in the breezeway we encounter Bruce Nauman’s No, No, New Museum playing in a dissonant loop between two CRTs an image of a manic jester shouting ‘No! No! New museum!’ Each of the two displays goes in and out of phase with each other in a 62-minute loop. Sha Li likes. It was created in 1987 and sold recently at Christies for $1,625,000. On the fourth floor is the video installation Freedom by Josh Kline, a dystopian mockery featuring 3-D printed and painted “police teletubbies” and US presidents, actually actors augmented with facial substituting software, captivating in a flat screen loop Kline’s futuristic view. Kris and I hurry past Van Gogh paintings and 3-D printed and painted donuts to gain the fresh outdoors. Down the street at chic South Park Seafood and Oyster Bar, tables alfresco beacon on SW Park. The Happy Hour 4-6 features oyster specials of sixteen varieties from Washington, Oregon, New Brunswick, Prince Edward Island, Massachusetts, New Zealand and Deep Bay BC. Their vodka mojito is textbook perfect, so good I had two!!! Macy’s and Nordstrom’s are nearby as well as Mario’s for Men. We finish up the evening at Hubers, the oldest restaurant in Portland established in 1879, but the attraction for us is the over-the-top Victorian bar buried in its interior. Following passages and corridors, we arrive at an airy room with vaulted, stained glass windows and lots of dark wood. The bartender, Kyle, concocts a memorable double chocolate vodka mojito! Amid flaming Spanish coffees firing off every five minutes. Kris and I sit across from a $900 cut crystal carafe of cognac going for $200 a shot. I love Portland! Go by bike! Go by tram! Go by train! Early Start today, I’m meeting Ray at the Portland Aerial Tram, a people mover taking patients and employees up to University of Oregon on Marquam Hill from South Waterfront. See the 2015 Garaventa AG – systemfilm ATW on Vimeo here. This is the most diverse transportation intersection IN THE WORLD! Incorporating aerial commuter tram, cars, busses, shuttles, streetcar, pedestrian bridge, shipyard, cycle track and densest bike parking in America in the #1 biking city which is Portland. After our VIP tour at the tram, Kris and I order lunch at Elephant’s Deli nearby and sit on steps in the shade with university workers: a garden vegetable soup and BLT with carrot juice. Check out the view from the top. That's me on the left with Ray. That afternoon we discover what happens when a Smart Car is left in underground parking at Fred Meyer: it can’t find its Wi-Fi signal. LOL! It’s not in the prettiest part of downtown. We pass strip joints and addicts lounging on corners or stretched out on cardboard mattresses as we pass by on our way to Chinatown and Fei Long Spa. The exterior is reminiscent of my China trips—this must be genuine. The interior doesn’t disappoint. We’re escorted upstairs past foot massage room lined with chairs. A man with very small ears on a large head takes charge of my body. About my neck he says, “Very bad.” I agree, “Bu hau. You fix.” Which he does, and the hip and leg. OMG. I’m so happy. After I got home I tried my own version of dolmas using fresh leaves from Cafe Maddalena and a brown rice filling with currants and mint. The tzatziki sauce is awesome! Thanks Chef Lani. Next we go off to Sur la Table and Team Dunsmuir with Chef Lannie Kali on Date Night: An Evening in Greece. We learn how to hold a knife, but an onion and mince garlic before moving swiftly to Grilled Feta Stuffed Grape Leaves, Lemon Chicken Souvlaki with Tzatziki Sauce. When we finish with the knives we get the vino! And then we enjoy our production with Baklava Ice Cream. I’m slightly drunk and happy, with bodacious and beautiful girls out in the warm night with hip boys. So much fun. Today we set to find Video Art/Art Video at galleries in the Pearl District between downtown and the Willamette River. The first stop on our private walking tour is UPFOR Gallery on NW Flanders. Displayed against the wall of the office is Centri Lattice by Brenna Murphy on HD Video, 2014, $2500. The Portland Biennial is a major survey of Oregon visual artists. It’s an extension of the Portland Art Museum Oregon Biennial founded in 1949. After a brief hiatus 2006-2010, Disjecta Contemporary Arts Center introduced a refreshed biennial with guest curators, multiple venues and a broader platform to engage larger audiences with the help of major sponsors the Ford Family Foundation, the Andy Warhol Foundation and the Oregon Cultural Trust. This show offers 101 artists works in a wide variety of media, including ten Video Art/Art Video pieces. Of the entire show, my two favorites were by women artists. Especially nice Formation II by Tannaz Farsi is an impeccable intaglio print. Charlene Liu, The Vessel, the Mist, the Morning Rain, is a screen print and acrylic on aluminum. Mt Shasta Black Cherry Lemonade as we pass the station in Eugene. Yum! So, I say to myself, get a hold of yourself. Can’t you see that it never can be? The last vodka cocktail of the trip on Amtrak: Mt Shasta Black Cherry Lemonade. Cheers! And as coincidence prowls the train’s aisles, I catch Thomas Carlisle’s eye in the dining car. He’s on his way back, same train #14 as I left on a week ago and the same train #11 returning today! CWP Publishing is the publisher and promoter of the author Sha Li and the political thriller series 'An American in Beijing.' Books: Beijing Abduction 2014, Wounds of Attachment 2015, Escape from Here 2016. What if China and the US collaborate and cooperate on espionage, cyber and physical spying, and apprehend international criminals for their mutual aid and benefit?